This 31 month child was admitted to a country hospital following a seizure. She became unconscious and was referred to Red Cross Children’s Hospital. She showed the features of stage III tuberculous meningitis* and her condition rapidly deteriorated despite the initiation of treatment.. 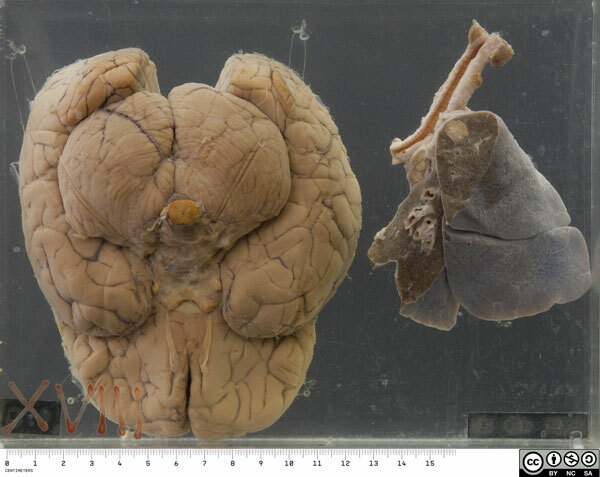 The specimen comprises the right lung and the inferior half of the brain. 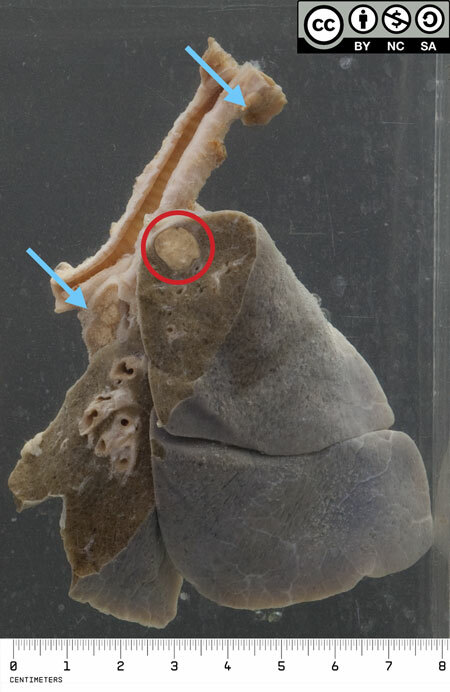 There is a Ghon focus in the apex of the lung, and the hilar, peribronchial and peritracheal glands are enlarged and caseous – this is a primary tuberculous complex or Ghon complex. 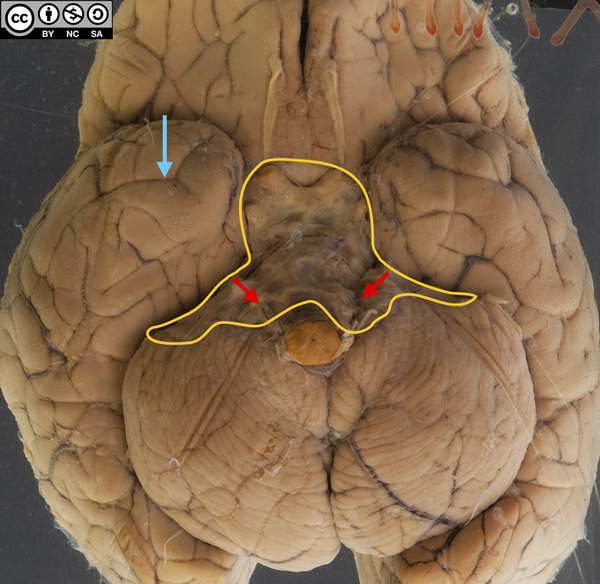 The brain is markedly swollen, with flattened gyri and narrowed sulci. There is a thick, fibrinous exudate limited to the region of the basal cisterns. This envelopes the circle of Willis and several cranial nerves, in particular the 1st (optic) and the 3rd. 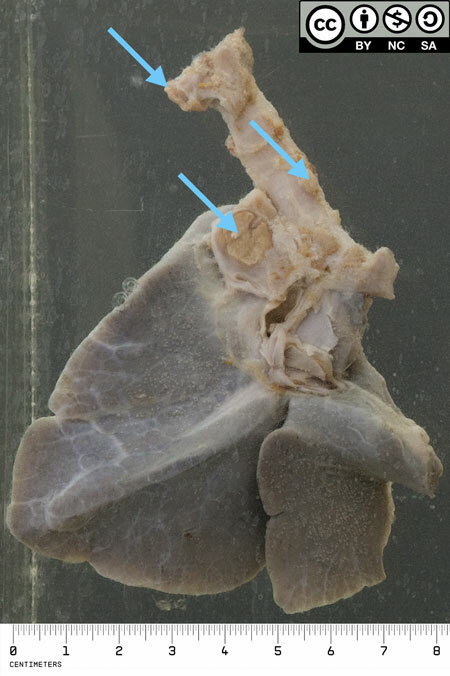 The lateral (exit) foramina of the 4th ventricle are also obscured. 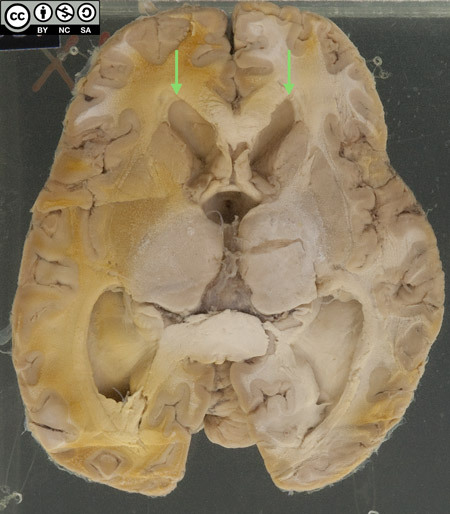 The reverse of the bottle shows an axial section of the brain through the basal ganglia, thalamus and lateral ventricles. 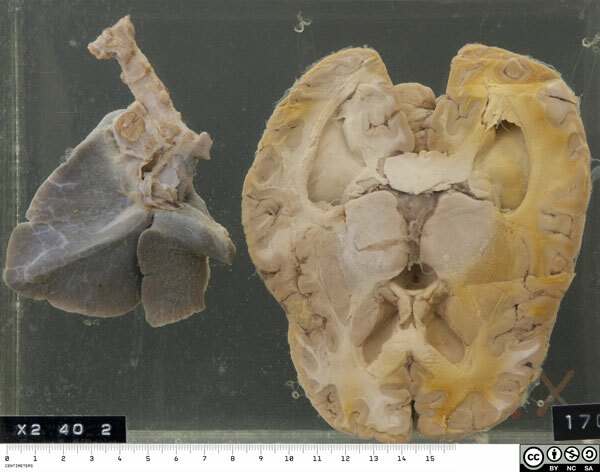 There is striking symmetrical ventricular dilatation, as shown by rounding of the normally acute anterior horns. 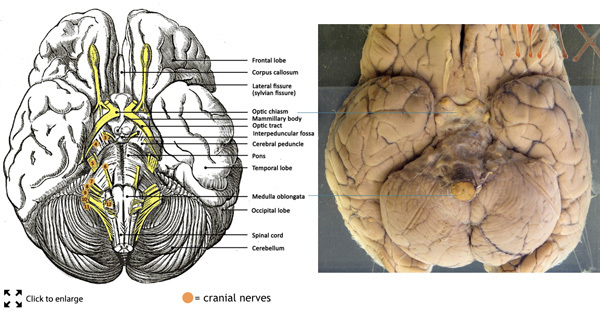 Tuberculous meningitis (TBM) in young children typically follows haematogenous dissemination of bacilli to the choroid plexus and then to the cerebrospinal fluid. The inflammatory reaction is concentrated in the basal cisterns. In older age groups TBM typically follows rupture of a leptomeningeal / cortical tuberculoma ("Rich-McCord focus") into the cerebrospinal fluid. A common complication of TBM is vasculitis and thrombosis of small penetrating vessels, leading to brain infarction and focal neurological deficits. A 2nd important complication is obstructive hydrocephalus, usually non-communicating due to obstruction of 4th ventricle exit foramina. This is typically in longstanding untreated cases (several weeks) when the inflammatory exudate has becomes thick and fibrous. A 3rd important complication is one or more cranial nerve palsies. Deafness (8th cranial nerve) is especially common in survivors. Infection with Human immunodeficiency virus (HIV) increases the risk of developing TBM, as well as the risk of complications and death. Garg RK. Tuberculous meningitis.Acta Neurol Scand. 2010; 122: 75–90. van Well GT, Paes BF, Terwee CB, Springer P, Roord JJ, Donald PR, van Furth AM, Schoeman JF. Twenty years of pediatric tuberculous meningitis: a retrospective cohort study in the western cape of South Africa. Pediatrics. 2009;123(1):e1-8.